Hear embryo adoption stories from people who have been there. Learn more about the frozen embryo transfer success rates and what it’s like to give birth to your own Snowflakes babies. If you have questions or would like to start the Snowflakes adoption process, give our team of experts a call today. The day we were diagnosed with infertility (and given very few fertility options) was such a dark day for us. In an instant, our dreams of becoming parents to genetic children vanished, and we felt so overwhelmed with that loss. While we were heartbroken and frustrated that we were given so few options, we see now how God was preparing our hearts for the family He had always intended for us. Early in our research, we had come across the beautiful option of embryo adoption. The fact that you could carry and give birth to your adopted child seemed like such an amazing thing! So when we were faced with the reality that we would not have our own genetic children, we knew that embryo adoption was something we wanted to pursue. We didn’t really know where to start in the process, so we knew we would need some guidance. We chose the Snowflakes Embryo Adoption Program, because they pioneered the process, and we wanted to partner with an agency that would uphold a high value on life. We are so grateful for our relationship with them. In each step of the process, we felt confirmation about our decision to pursue embryo adoption. While we knew this was the path to a family we wanted to pursue, it was not without its own set of heartaches and struggles. We initially matched with a sweet donor family in our home state. We gave all the adopted embryos a chance at life, but unfortunately, we did not have a successful pregnancy. We were once again left heartbroken and frustrated, wondering if we would ever have children. Nightlight was kind and gracious through the whole process. We did decide to rematch with another family, and soon we adopted more embryos. We welcomed our first 2 snowflake babies in November of 2016, boy/girl twins! They are our rainbow babies, the beauty of God’s faithfulness after the storm. We transferred another embryo in November 2017, but unfortunately, we had to say goodbye to that sweet little one. We tried again with our last embryo, and we welcomed our third snowflake baby in August of 2018! He is such a blessing and joy to us, and we love the fact that all 3 of our snowflake babies are full genetic siblings. We will forever be thankful for embryo adoption because through it, we got to experience pregnancy and become parents. There will never be enough words of gratitude to express to the donor families for the gifts they provided to us by making the decision to donate their embryos and entrust us with their care. It is incredible to me how God was preparing our family, even way back in 2007 (when our first embryos were frozen), and then again in 2009 (when our second set of embryos was frozen). How He led my husband and me to each other, walked with us in our road of infertility, and led us to pursue embryo adoption. He allowed us to skip all other fertility options so that we would discover and then choose this unique path to growing our family. I believe this is part of the reason we had to walk the road of infertility- because God always intended us to be the parents of these precious little ones. We had to stand out in the cold for a bit so we could stand back now and be amazed at the beauty of the family God created for us. Placing parents are the ones that did something great. It was their decision that was life giving to the baby. We always knew we wanted to have kids in our family. And we knew that they could come lots of different ways. So we always thought we would have our kids by our own genetics and that we would also adopt. And after we had our daughter, we knew adoption was what we wanted to pursue for baby number two. We met with an adoption agency in Indianapolis. We remember they were excited to have us, but they were pretty honest that if we wanted to bring home an infant we could be waiting a long time. But they were quick to tell us about another option called embryo adoption. This was an adoption path were we would be matched with a family looking to make arrangements for embryos they were not going to use after going through IVF. When they were explaining this to us, it felt like it was sci-fi! But during the car ride home from the agency, we talked and the option just felt right for both of us. However, we were coming from a desire to adopt and we believe first families and genetic families are an important part of a child’s identity. Most of the clinics, if you receive “adopted” embryos, it’s anonymous. And we felt like, for us and our family and our future kids, that was not the best option. We wanted a connection to their genetic family, so we chose an adoption agency for our embryo adoption: the Snowflakes Embryo Adoption Program. We wanted the children who would come from the adoption to be able to know their story completely and have relationships with their genetic siblings if they wanted to. The other reason we wanted to use Snowflakes over a clinic is because the Snowflakes model allows the genetic family (or placing parents) to choose their adoptive family. At most clinics, the adoptive parents choose the match. This was important to us because the placing parents created the embryos. They are theirs first. And they are the ones who should have that decision to choose whose they become. We were first matched with six embryos, and over the course of two years we transferred those embryos. Sadly, those six embryos did not result in any babies. After that we took a step back to reflect on our journey. We had spent a lot of time, resources, and emotions on that match and those embryos and we still didn’t have our baby. We remember those days of us being a little conflicted about what to do next. Do we move forward and match again? Do we try again naturally? Should we take a look back into traditional adoption? Our faith was a big part of our decision. We felt like there was a plan for us that was meant to be—there were other frozen babies out there somewhere, waiting for their forever home. So we decided to go back to find another match. When a second family was considering us to adopt their remaining embryos, they had some additional questions for us. Their main question being, “Why are you adopting embryos when you are not infertile?” We knew they loved these embryos and they cared about them deeply. They were making an important decision. In the end, they chose us to adopt their embryos and we accepted. On our first frozen embryo transfer with our new adopted embryos, we were pregnant right away! You could say we had a textbook pregnancy. We have heard people say, “What you’re doing is go great by rescuing these embryos!” And yes, we are excited about it, but really the placing parents are the heroes. They are the ones that did something great, because had they decided to destroy their leftover embryos or keep them frozen, our baby would not be with us today. It was their decision that was life giving to the baby. Living over seas, they thought they had exhausted all their options. Then they heard about embryo adoption. If you are considering embryo adoption, let me encourage you: God works on His terms and His time. God kept the door to adoption wide open, though. Our interest in embryo adoption began with Julie’s work as a researcher in an obstetrics lab. As part of her studies, she witnessed firsthand the amazingly complex design of each embryo. The experience convinced her each embryo is fearfully and wonderfully made (Psalm 139:14). It is not necessarily a culturally acceptable point of view, but it is our view nonetheless. God’s providence ensured everything worked out in an unbelievably wonderful way. If you are considering embryo adoption, let me encourage you: God works on His terms and His time. Trust it, pray about it, and go where you know you need to go. Two years after beginning our adoption journey, we welcomed little Phoebe into our lives. She was the only one of three which survived the thaw. We committed to our incredible placing family that we would maintain an open adoption with regular correspondence and the possibility of an in-person visit in the future. Little did we know they lived less than two hours from our home, creating a perfect environment for nurturing a close relationship as our daughter grows up. Nate is the author of the blog Thaw Your Baby: The Embryo Adoption Blog, where he shares practical embryo adoption tips and encouragement for couples seeking to adopt. You can also watch them speak about their adoption experience in the video Experience and Insights: A couple shares their embryo adoption story on YouTube. 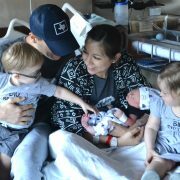 Jeremy and Emily never planned on a large family, but God blessed them through the miracle of embryo adoption! The story of how the first embryo adoption came to be. Life began for Hannah Strege, as it now does for tens of thousands of children every year, in a laboratory dish, where she was one of more than 20 embryos created during a routine cycle of in vitro fertilization (IVF). This popular treatment for infertility combines male sperm with female eggs in a controlled environment before introducing one or more viable embryos into a woman’s womb. To increase the odds of a successful pregnancy, doctors often create many more embryos than can responsibly be transferred at one time. This allows a couple not only to select the most promising embryos for transfer, but also to have backup embryos should the first attempts at implantation fail. The dark side-effect of this common practice is an enormous surplus of unused embryos — estimates range from half a million to as high as four million in the U.S. alone — frozen and waiting for a chance to grow and be born. For many of these tiny children, that chance never comes. They are destroyed, donated to scientific research (that is: destroyed) or kept on ice in near-perpetuity while those responsible wait to decide what to do with them. Her future uncertain, Hannah’s state of frozen limbo might have continued indefinitely had a pair of unlikely heroes not come to her rescue. John and Marlene Strege didn’t set out to become groundbreaking pioneers. They simply wanted to welcome a child into their family. Infertility issues, however, left them with few options — none of which was especially appealing to them. Doctors recommended IVF with donated eggs, but the Streges were deeply uncomfortable with the idea of using the eggs of another woman, thus conceiving a child outside of their marriage bond. They also worried about what would happen to any unused embryos. It was this concern that led them to ask about a previously unheard-of possibility: embryo adoption. This was the burning question that John and Marlene wanted answered before they were willing to consider moving forward with the pioneering procedure. Indeed, it’s a question that continues to trouble the minds of many life-loving Lutherans to this day. Seeking answers, Marlene decided to reach out to four people she thought might be able to help: the Rev. Dr. Charles Manske, founding president of Christ College, Irvine, now Concordia University, Irvine; the Rev. Dr. Samuel Nafzger, then head of the LCMS Commission on Theology and Church Relations (CTCR); the Rev. Robert Dargatz, then assistant professor of Religion at Christ College and a member of the CTCR; and Dr. James Dobson, then head of the evangelical media ministry Focus on the Family. We consider that respect for human life can also be expressed by making embryos available for adoption by couples willing to provide the opportunity for life. Bolstered by the assurance that this course of action would be God-pleasing, the Streges began to explore embryo adoption seriously. The “embryo” part was easy. Their fertility doctor had access to any number of frozen embryos they could request. It was the “adoption” part that turned out to be much trickier. At the time, embryos were (and in most states, still are) legally considered property, not persons. As such, they could easily and simply be donated — but adopted? In 1997, the necessary regulations and procedures simply didn’t exist. The Streges were clear, though: They wanted to pursue an open adoption, whatever it took. Guided by a friend at Nightlight Christian Adoptions, the Streges began to navigate California’s complex web of adoption requirements. They tackled mountains of paperwork, submitted to home studies and visits with social workers, and identified a family — Hannah’s — that was willing to place their embryos in an open adoption. Along the way, the Streges lost both their infertility doctor and their health insurance coverage for the procedure, paying for their adoption and medical expenses out-of-pocket with a providential windfall that arrived when John (a sports writer) sold a biography of then-up-and-comer Tiger Woods. At long last, in the spring of 1998, the Streges’ adoption was finalized, and 20 frozen embryonic children were Fed-Exed to John and Marlene in Pasadena. Then came the hard part. The scary, heartbreaking part. Twelve embryos were thawed in succession. Only three survived the thawing process, and although all three were introduced to Marlene’s womb, not one of them successfully implanted. Their nerves raw, John and Marlene waited anxiously as the remaining eight embryos were carefully thawed out on Good Friday. Again, only three survived, but of these three, two appeared to be fully viable. They were transferred to Marlene on Holy Saturday. After one more anxious wait, the Streges finally had the good news for which they’d been waiting and hoping for more than a year. “The doctor’s mouth just dropped when he saw the ultrasound,” said Marlene. “He determined that there was one baby, with one heartbeat, and he called it “a textbook implantation”. Hannah — her adoptive parents’ “gift from God” — was born December 31, 1998, the first-ever child to be born through embryo adoption. Her parents and Nightlight Christian Adoptions dubbed her a “snowflake baby,” reflecting her origins as a tiny, frozen, yet utterly unique human being. Not every family with small children testifies before the U.S. Congress, but that’s what John and Marlene were called upon to do in July 2001. Scientists had recently discovered how to extract stem cells from unwanted embryos (destroying the embryos in the process), and lawmakers were grappling with whether or not to allow federal funds to be used for this controversial research. Toddler in tow, the Streges stood before Congress to testify against embryonic stem-cell research. The Streges’ testimony stood in stark contrast to this point of view, highlighting the humanity and dignity of all embryonic children and the need for them to be adopted and cared for in loving homes. “It put a face to this topic,” said Marlene. Five years later, in 2006, the Streges again traveled to Washington, D.C., to stand behind President George W. Bush for the first veto of his presidency. He used it to block the Stem Cell Research Enhancement Act of 2005, a bill put forward to ease restrictions on federal funding for embryonic stem cell research. Twenty years after Marlene’s long-hoped-for pregnancy, Hannah is a young woman on the threshold of adulthood, and her parents are adjusting to life in their newly empty nest. “We are, all three of us, transitioning into a new season of life,” said Marlene. “We have such fond memories of Hannah’s childhood, in part because she had a wonderful Lutheran school to attend preschool to 8th and then a great Christian high school. Their attempts at pregnancy success in that first year culminated in the sad diagnosis of infertility. That was a huge change in the plan! Rachael and Pete were hoping to have children, but they found out quickly having babies may not be as easy as they expected. Rachael and Pete were hoping to have children, but they found out quickly having babies may not be as easy as they expected. Fertility treatments lead to the birth of their first son Samuel and then a devastating miscarriage. Instead of continuing down the path of fertility treatments, they decided adoption would be a better investment of their resources. They chose to apply with Generations Adoptions, now a division of Nightlight Christian Adoptions. The waiting was very difficult, but while they waited, God was working in their hearts. “I had not been feeling ready to face the significant chances of losing children who did not survive the thawing process, a risk associated with embryo adoption. But over that year, I became convicted that taking serious emotional risks is sometimes an important part of answering the call to love one’s neighbor as one’s self,” Pete remembers. After a year, it was time to renew their home study, and they decided it was time to switch from domestic infant adoption to Nightlight’s embryo adoption program, Snowflakes. The couple completed the embryo adoption in October of 2015 and in December traveled to New York City for their first frozen embryo transfer. One of the two embryos thawed did not survive, but one did, resulting in the birth of their son Owen, Snowflake baby #487. The relationship with their adoptive son’s placing parent at the outset managed by the Snowflakes staff. Over time both families have become open to more direct contact, and Rachael and Pete will meet her when they travel to New York for their next transfer. 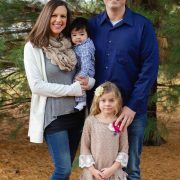 Rachael and Pete are so thankful for Nightlight Snowflakes embryo adoption program and the role that they have played in bringing these children into their family. Our family building journey has brought us nothing but joy and happiness! Unfortunately, it did not start out that way. Our family building journey has brought us nothing but joy and happiness! Unfortunately, it did not start out that way. We had one son we were certain we wanted more children. After three miscarriages [a genetic incompatibility factor], we decided to discontinue our attempts to conceive another genetic child. We decided to explore adoption as a means for growing our family. We first tried domestic infant adoption, but that lead to additional heartbreak. We were determined to bring another child into our home – we have so much love to give! One day, I was sitting at my computer, and I decided to type ‘I want to have a baby!’ into the search bar. The Snowflakes Embryo Adoption Program was the first item in the search results list! Like many people, we had never heard of this option before. What a strange and foreign concept! I called Snowflakes and gathered as much information as possible. The more I learned, the more I knew that this was the answer to our prayers. Full speed ahead! I submitted our application and honestly, I’m not sure my loving husband had actually processed what we were pursuing yet. We completed our home study and selected a clinic. We waited as patiently as possible for a family to choose us to adopt their remaining embryos. Our first match didn’t work out. It was incredibly disappointing, but we received lots of encouragement from the Snowflakes team. Quite quickly we were selected by another placing family who had four kids through IVF. After the adoption was finalized we had snippets of contact with the family mediated by Nightlight. The family answered some question we had and sent pictures of their whole family. We had our first embryo transfer. We transferred one embryo and learned we were pregnant. Joy! Happiness! Apprehension. Would the pregnancy stick? It did and the entire pregnancy was incredibly smooth—absolutely perfect. We decided we wanted to reach out to our placing parents and see if they would like to exchange email addresses. This led to us exchanging phone numbers. After texting, talking emailing we established a wonderful, personal relationship between us. 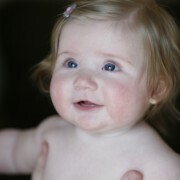 We felt blessed and honored they chose us to be able to give one (and someday more) of their embryos a chance at life. The Christmas after our embryo adopted son was born, both families agreed to meet at a hotel. As the family who gifted us with embryos came into the hotel lobby, I felt an instant connection. I was holding the baby they created; the baby they blessed us with. It is extraordinary to think that before any of us knew each other, or even were born ourselves, God had a plan. God knew this baby and He knew he would be a part of our family. I hope our journey as ‘extended family’ has only just begun. The joy and happiness we feel now can only continue to grow! Everyone thought Charlie and Matt should have the first bucket to try again and have a baby. When Matt and Charlie DeVore got married, there was no question they would be parents. Matt had always dreamed of having a big family with five kids. But getting to that first baby seemed impossible. Charlie struggled to get pregnant. After unsuccessful fertility treatments, the couple was matched in a domestic adoption. Everything looked final, but then at the last moment, the adoption fell through when the birth mom changed her mind. After ten years and $35,000 spent in their attempts to build their family, Charlie was trying to accept the idea that she wasn’t meant to be a mom. “I think I went through a lot of emotions. I was just broken. I felt like a broken person,” she recalls. The couple didn’t have the finances to try again and Charlie was left wondering and trying to decide if she could just walk away. Then Matt’s uncle died in a car accident, so the couple drove to be with the rest of his family. Matt’s uncle was a farmer and had buried money in buckets. Part of the time spent together as a family was spent digging up the farm to find the inheritance he left behind. Everyone thought Charlie and Matt should have the first bucket to try again and have a baby. 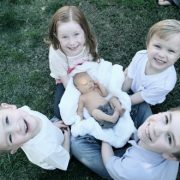 Matt’s sister, Julie, volunteered to be a surrogate. But Charlie’s eggs had been problematic and didn’t get large enough to fertilize. They were beginning to feel they were out of options. That’s when Julie came back to suggest embryo adoption through Snowflakes. Charlie and Matt had never heard of it. They were matched with a placing family welcomed a little girl into their family through donor egg IVF. Afterward, they conceived naturally and decided to donate their remaining embryos through Snowflakes. They chose the DeVores. Julie carried the pregnancy for Charlie and Matt and gave birth to her niece, CJ. “Right away she held on to Matt’s finger,” Charlie reminisces. CJ will know the other little girl – her biological sister – born from the same batch of embryos. And the DeVores will make her a book of her life story, so she knows all the people it took to make them a family and to erase their heartache. “You know, she may not understand it all, but so she grows up with it. It’s never a shock or something that’s a secret,” Matt said. How were we going to find a certified social worker in Israel to do a home study? When they wanted to bring home a second child, Guatemala had closed its doors to international adoptions. Travis and Annette both dreamed of having a big family someday but knew the only way they would be able to expand their family was through adoption. Travis had leukemia when he was a child and after eight years of extensive and grueling treatment he beat the disease, but it left him unable to have children. When they were ready to start a family, they decided to adopt internationally from Guatemala. Their first child, Cornelius, was adopted in February 2007. Sadly, when they wanted to bring home a second child, Guatemala had closed its doors to international adoptions. They decided to look more extensively into other forms of adoption, including embryo adoption. Travis and Annette decided to apply through the Snowflakes Embryo Adoption program. The couple first matched with a family that had four frozen embryos. However, when they were ready for the frozen embryo transfer (FET), the doctor informed them that only two of the embryos survived the thaw. The remaining two were transferred but, unfortunately, a pregnancy did not occur. Both Annette and Travis felt a great sense of loss not only for the two transferred embryos but also for the embryos that did not survive the thawing process. The couple strongly believes that life begins at conception. For them, losing these embryos was the same as losing a newborn baby. Travis and Annette courageously decided to try embryo adoption again. They matched with another family who had four remaining embryos. This time, Annette became pregnant! Their son Corbin was born early in 2011. In 2013, Travis and Annette went through the embryo adoption process for the third time and matched with two families: one with two embryos and one with three. This unique match resulted in a twin pregnancy: Cadence and Coralee, who were born late 2014. Travis and Annette strongly believe in openness with their adopted children. The family has a relationship with their daughters’ biological family, sending updates and pictures of the twins as they grow, and leaving the door open to any potential questions the girls might have in the future. The relationship has been so beneficial and valuable to the family that the couple wishes they could have the same relationship with their sons’ biological family. They are diligent in their efforts to help each of their children understand how they came to be a member of the family. Travis and Annette love their big family and are not opposed to it becoming bigger still. According to them, they have never had so much fun and would not want to live their lives any other way. Even before attempting pregnancy the couple had considered adoption, but never a specific type of adoption program. While in college, David and Renee met during a mission trip in the states. Smitten, David transferred to Renee’s college in North Carolina and they decided to pursue a relationship. They married after dating for a couple years. Of course they wanted children – eventually and after five years of marriage decided to start expanding their family. “Renee was able to get pregnant rather quickly, but unfortunately soon into that pregnancy she miscarried,” said David. Renee’s physician discovered she was in pre-menopause. It would be highly unlikely that they would ever conceive again on their own. Embryo adoption? Get pregnant? Carry a baby and give birth? It seemed too good to be true! 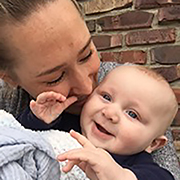 Renee had never lost the desire to carry a baby and doctors could find no reason she couldn’t. With eager hearts, David and Renee started down the path of a Snowflakes embryo adoption. They completed a home study and created a profile. They were matched with an out-of-state couple who had 12 embryos to gift to them. The donors had three genetic siblings from this same set of embryos. “They choose us and we choose them,” said Renee. Six embryos were thawed. Four didn’t survive. Two were transferred to Renee’s womb. About a year and a half after beginning their adoption search, Renee gave birth to their daughter. “I truly believe that God had her set apart as a little embryo for our family,” said David. Hannah’s story won’t be a secret. Hannah’s parents plan to tell her all about how she joined their family. The open adoption model was an added blessing. Many couples have questions about the open adoption model used by Snowflakes Embryo Adoption Program. They wonder how much will be expected from them when it comes to communicating with another family about their children. How open does an open adoption have to be? The open adoption model simply gives families the opportunity to stay in contact. How much or what method they use to do that is entirely up to the families themselves. For the Trabun and Smith families, an open adoption means staying in contact through email and sending presents for special occasions. 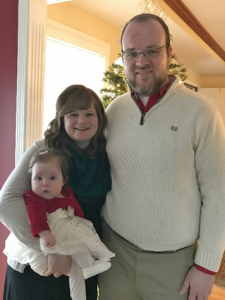 Stephanie Smith and her husband, Brian, say that the embryo donation program was an answer to their prayers about what to do with their remaining embryos. The open adoption model was an added blessing. Staying in communication with the Smith family has been beneficial for health reasons, too. When the Smith’s children developed a food sensitivity, they alerted Christy who was able to watch for and diagnose the same sensitivity in their son, Cade. Without an open adoption arrangement, Christy would not have been able to diagnose the allergy so early. The Trabuns talk openly to their children about where they each came from, including the embryo adoption process. Christy uses pictures and age-appropriate information to help them understand how they became a part of the family and plans on continuing the discussion in the future as they are able to understand more. She and Mike say that being in open communication with their children’s’ biological family has helped prepare her for questions that they will likely have as they get older. For now, the families have no plans to meet in person but will continue communication through email. In the future, though, they say they are open to whatever their children want. Like many adoptions, our journey was filled with ups and downs. Several years ago, we learned that it is medically impossible for us to conceive a child. Before seeing our fertility doctor, we had both separately learned about the Snowflakes Embryo Adoption program. After receiving our diagnosis, we quickly realized we were called to adopt embryos. But like many adoptions, our journey was filled with ups and downs. After several matches failed transfers and miscarriages we had another transfer in February 2006 with our remaining embryos, and we had decided that this would be our last transfer if it was not successful. Instead, though, we were thrilled to learn that we were pregnant, and this time we were expecting twins! But once again, joy was accompanied by heartache when we had an ultrasound at 16 weeks and learned that one of the twins had died at the end of our first trimester. Thankfully, we were blessed with Ethan Richard, who was born on October 19, 2006! When Ethan turned a year old, we began thinking about how to expand our family. After our first experience, we had no idea what the path would look like. We were matched with a genetic family and adopted eight embryos. We had our transfer last October, and just prior to Ethan’s second birthday, we found out that we were pregnant! We were blessed with Tyler Matthew on June 21, 2009. The first child born through the pioneer embryo adoption program called Snowflakes®. Embracing new ideas and concepts, or expanding one’s notions of them, is what my story is about. I am the first adopted frozen embryo in the world. When my parents, John and Marlene Strege, struggled with infertility, they were devastated. They only wanted a baby. My mother was diagnosed with premature ovarian failure, which meant she was not longer producing eggs. Distraught, she asked her doctor if he had any frozen embryos they could adopt. “Well, yeah, I’ve got a lot of embryos,” he said, while explaining that he had never been asked that before. In that moment, the ways that one might adopt a child had expanded to include frozen embryos. Meanwhile, thousands of miles away, my biological family also had struggled with infertility. Desperate to give their only daughter siblings, they turn to in-vitro fertilization, or IVF treatments, and created 28 embryos. After transferring four, they became pregnant with triplets. They had 24 remaining lives with whom to concern themselves, myself among them. My parents were anxious to get opinions as to what God would think of adopting embryos. Would this be biblically pleasing to God? They consulted with the late Dr. Charles Manske, the founding President of Concordia University Irvine, Pastor Bob Dargatz, who was a professor Religion at Concordia at the time, and Dr. Sam Nafzger, Head of Commissions on Theology and Church Relations of the Lutheran Church Missouri Synod in St. Louis, MO. They all came to the same conclusion: God valued all life, that life began at conception, and providing frozen embryos a chance would be honorable to God. My parents also contacted Focus on the Family, seeking Dr. James Dobson’s opinion on adopting frozen embryos and whether God would approve. Dr. Dobson called my mom a week after her original contact. He said that he now knew what to tell her, and that first he himself had to get counsel. He said he would not speak for God; however, he felt that it was a moral obligation to adopt frozen embryos if the original family was not going to use them. My mom and dad were about nine months into the adoption journey (this is nine months after the original contact with Dr. Dobson) and not closer to finding a family who wanted to place their remaining embryos for adoption. Due to HIPAA laws (confidentiality of medical records), doctors could not give them names of people who had remaining frozen embryos. Then Dr. Dobson invited my parents to Colorado, to Focus on the Family headquarters. He thought they might need a break from the emotional stress. He arranged for them to have lunch with the director of the crisis pregnancy division at Focus. Six weeks later, the head counselor came to the director’s office and said, “I just got a phone call from a woman who has 20 frozen embryos she wants to place for adoption.” The director replied, “I know who the adopting family is!” She referred the couple to Nightlight Christian Adoptions and its executive director, Ron Stoddart, a close family friend doubling as our adoption attorney. God’s fingerprints were all over this. My parents adopted 20 frozen embryos and we were shipped via FedEx from Nebraska to my parent’s doctor’s office in California. We had been frozen and awaiting a home for more than two years and were blessed to finally start on our journey towards the fulfillment of life. Embryos are stored in straws, two to three per straw in my case, in tanks of liquid nitrogen. The doctor thawed a straw at a time. I was the only embryo out of 20 to survive the thaw and successfully transfer to my mother’s womb and finally to birth. On December 31, 1998, the Streges became my parents. Nightlight Christian Adoptions has since established the Snowflakes Embryo Adoption Program and more than 580 embryo adopted babies (a.k.a. Snowflakes babies) have been born through this program. It has expanded the horizons and the minds of many waiting parents on how they might grow their families. Adoption is often overlooked and forgotten. Human life is a miracle, sacred and precious to the King. Miracles are born out of divine intervention. We are the Lord’s handiwork, servants of His kingdom. It is our job to take the gifts God has given to us and grown in our knowledge of who He is by how He works in our lives. God placed may parents on a journey of a lifetime that resulted in answered prayers. My life has been a blur of pro-life activism. I have expanded on my mother’s initial vision for a child. To dedicate my career and my life to finding homes for frozen embryos awaiting a chance at life around the world. My parents took a chance on me. Look to God and expand your knowledge of Him and His potential to work in your life. We discovered our chances of getting pregnant were very low—only about a 1% chance. I heard about embryo adoption for the first time, I don’t know how many years ago, on Focus on the Family radio broadcast. I wasn’t married at the time, but I had childhood cancer and had undergone radiation on my abdominal area. Some of my doctors said to not worry about it, but another doctor said it could be an issue. I remember when I was about nine years old, a woman from church came over to our house because she was concerned about my fertility. She had a similar experience with radiation and was infertile as a result. So while I knew it was a possibility that I would have problems getting pregnant, it wasn’t something I focused on. After my husband and I got married we didn’t waste any time trying to conceive, as we were both in our 30s. But we knew right away we were going to have problems getting pregnant. We discovered our chances of getting pregnant were very low—only about a 1% chance. We were referred to some of the best doctors in the country, we were told that I could not get pregnant genetically, but they thought I could carry a baby. I started thinking about Snowflakes (The Snowflakes Embryo Adoption Program) again, but it took my husband a while to warm up to the idea. He was more open to the idea of finding an egg donor. For women, I think it’s sometimes a little easier to think about raising a child who isn’t genetically related. Women are natural nurturers, and we just want a child to love…it makes it easier, I think, for us to consider raising a child that isn’t genetically ours. For men, I think the desire to reproduce and have children that are a part of them genetically is stronger. It took us several years to get on the same page. I kept praying about Snowflakes and felt peace about it. I felt like embryo adoption was such a great gift, not only for us but for the family who was donating the embryos, as we would give those embryos a chance at life. We went through further surgeries and we tried a few “experimental” things to see if we could get pregnant, but nothing worked. One spring we were driving in the middle of Texas, and my husband was fiddling with the radio…and there was someone from Nightlight on a local AM station talking about Snowflakes. Shortly thereafter, my husband told me that he felt this was a confirmation for us to choose embryo adoption. We both felt that these embryos were all lives, waiting for a chance and that they are each deserving of that chance. I would say the process with Snowflakes moved very quickly in my mind. The hang-up was getting the home study done through a local agency that was going through a lot of transition at the time. They did our interviews in July and August but didn’t complete the home study until December. We were very patient and every time we’d check in our caseworker would say that she just needed a few hours to sit down and get it done. We had been very quick on our part to turn in the paperwork in the summertime and complete the education portion of the requirements, but the home study wasn’t completed until Christmas time that year. We were been matched with two potential families that we said no to for different reasons before we were matched with a family in California with three little boys, and nine remaining embryos. We were matched and just a couple of months later, in June, our embryos were shipped to our doctor’s office in Dallas. Shortly after that, we went into prep for the transfer. It took us three rounds before my uterus would respond the way they wanted it to. We had done a couple of mock cycles and it had behaved, but this time, when it came to the real deal, it had a mind of its own. Finally, on the third time, everything went as it was supposed to. The doctor thought that only four of our nine embryos were viable, but that we had a good chance of getting pregnant with the four that seemed the strongest. We decided to thaw the best two and weakest three, and only one survived the thaw. Our doctors said we could transfer the one or thaw the rest, but we felt at peace with just transferring the one that survived. And that’s what we did. Everything went beautifully, I got pregnant, and that was Elisabeth. I had a difficult pregnancy. We discovered mid-term (at 18 weeks) that I had a short cervix, so they put a stitch in the cervix to hold it together (called a cerclage). Everything was fine for a few weeks, as I was on modified bedrest at home; but then my cervix shortened pretty severely at 24 weeks, so they had me go on bedrest in the hospital for 8 weeks. They had hoped that my pregnancy would go full term, but my water broke at 31 ½ weeks. Since I was preterm, they let me wait it out until my labor started. I lasted about 3 days and I went into labor, at exactly 32 weeks. It was a pretty hard and fast labor, but Elisabeth came out breathing on her own and crying. Though she was 3 pounds 2 ounces, she was only in the intensive neonatal care units for 4 weeks, just learning to feed and grow. When babies are born that early, they can’t eat very well and aren’t very coordinated, but Elisabeth never had any issues. She was 4 pounds 5 ounces when we brought her home, still four weeks away from her due date. At that point, they knew the door had been closed forever on their ability to have a genetic child. 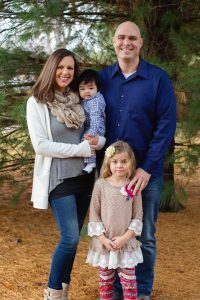 Mike and Michelle struggled with infertility issues for years when Michelle received the devastating news there were complications with her fallopian tubes, which would make having a genetic child extremely difficult. Doctors advised them that their best chance of starting a family would be through in-vitro fertilization. As practicing Christians, Mike and Michelle felt the moral issues surrounding IVF made it an option they could not pursue. They were particularly concerned with what might happen to any embryos they would not use. 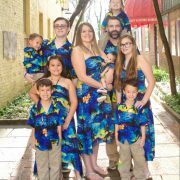 Instead, Michelle tried corrective surgery, which led to several failed pregnancies and eventually she required emergency surgery to remove her fallopian tubes. At that point, they knew the door had been closed forever on their ability to have a genetic child. Even so, they did not lose hope. Michelle was looking into different types of adoption when she came upon embryo adoption. She had never heard of the concept before and the idea intrigued her. She sent a text message to Mike saying, “What would you think if we gave birth to our adopted child?” To which Mike responded, “That’s the answer!” For the first time, they were able to visualize themselves with their own child. After applying to the Snowflakes Embryo Adoption Program, Mike and Michelle quickly found themselves selected by a placing family. Initially, they thought to reject this first match because it happened so quickly. They determined they should first take some time to pray and really consider the placing parent family profile. They concluded this was the right match for the. 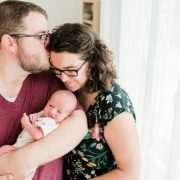 Michelle and Mike had their first FET using just one of the four embryos they adopted and were blessed with the birth of their long-awaited daughter Elora. They kept the remaining three embryos in storage until the time was right to try for baby #2 – who was born in January! Unable to conceive naturally, the couple decided to pursue other means of family building. Ultimately, we were selected by two couples – 2 embryos from one and 4 from the other. We were sent detailed medical and family histories of each of the placing parents, in case there might be anything about which we were uncomfortable. 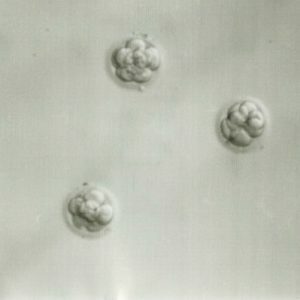 First cycle: of the first two embryos thawed, one died in the thawing process, and the one that survived was transferred. It failed to implant. Although I never actually had a positive pregnancy test, that experience felt very much like a miscarriage. Joe and I were starting to wonder what we’d set ourselves up for. When I returned to the infertility specialist to begin the second attempt, he re-evaluated everything and said, “I don’t know what happened last time, but it wasn’t anything wrong with you.” Healing words. So we proceeded with the process. When Jacob turned 18 months, we began planning for a final attempt at pregnancy with the 2 remaining embryos. We were both surprised and thrilled when that next pregnancy test was positive! Again, the six-week ultrasound was bittersweet: only one healthy baby. We welcomed Samuel home later that year. Our boys are genetic brothers as well as adopted brothers. We have pictures of their genetic older brothers, taken at about 3 years of age. If you saw them all in the same room, you could pick them out as four brothers. Someday, I hope we can meet their genetic parents in person to thank them. We are blessed. Meet two families who are building a story about life and sacrifice. Meet two families who are building a story about life, sacrifice, and one very loved little girl. Cecile and Michael DeMartini wanted to grow their family and assumed they would need the assistance of in vitro fertilization to conceive. When they naturally conceived their third child, though, they knew they would need to do something with their remaining embryos. So the couple agreed to donate their embryos through the Snowflake Embryo Adoption Program, where they were matched with the Reas. The Reas had one child and were eager to have more. 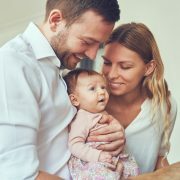 After several miscarriages, they tried a number of fertility treatment options but felt that embryo adoption was the right fit for their family: Joanna could carry the child, they could share the pregnancy with their older daughter, and bond as a family before the baby even arrived. “We knew there were families who had embryos and were struggling with what to do with them. We felt like we could take some burden off of them and still grow our family,” says David. Like many families who participate in the Snowflakes program, they were initially a little hesitant about an open adoption; as time went on, though, they became much more comfortable getting to know their donating family. The Reas are grateful to the DeMartini’s for their gift. Vivienne and her older sister Natalia experienced the joy of meeting one another during a recent holiday visit. The sisters enjoyed playing games, braiding hair and hanging out together. They hope to do it again soon. They liked the concept of embryo adoption. However, the idea of an open adoption was scary. Although Blaine and Kathryn had their three biological children and wanted more kids. They felt they should expand their family through adoption. Although Blaine and Kathryn had their three biological children and wanted more kids. They felt they should expand their family through adoption. And they did— child #4 was adopted into their family. They believed the door for adopting was still open. While researching different adoption agencies, they learned about embryo adoption. To them it was a foreign concept; at the time, they did not even know what in-vitro fertilization was, let alone embryo adoption. So they did an extensive amount of research on their own trying to understand if embryo adoption was something they would be comfortable with pursuing. After hours of research, and with even more hours in prayer, they concluded that embryo adoption was the direction that they wanted to go. Blaine and Kathryn chose the Snowflakes Embryo Adoption Program. The couple was very open with the types of embryos that they were willing to receive: they were interested in giving the embryos that were having a harder time being matched with adopting families a chance at life. Blaine and Kathryn were matched and later went in to have their frozen embryo transfer (FET). Only one of the three embryos they adopted survived the thawing process. They excitedly transferred this embryo into Kathryn’s ready-womb. They did get pregnant, but sadly the pregnancy ended in a miscarriage. After some time, Blaine and Kathryn decided they wanted to be re-matched through Snowflakes. This time around was unique as they were matched with two families who each had only one embryo to donate. On FET day both embryos survived the thaw but inexplicably their cell division did not seem to be proceeding as expected. Blaine and Kathryn were committed to the life of these two embryos and went ahead with the transfer. Miraculously in their opinion, Kathryn did become pregnant! At their 6-week ultrasound, a single heartbeat was detected. Though they had hoped for two babies, they were thrilled to see and hear one of the embryos survived and was now growing into a healthy baby. Yesterday we had our embryo transfer appointment. Unfortunately, we had to thaw all ten of the embryos we adopted. August 5: Yesterday we had our embryo transfer appointment. Unfortunately, we had to thaw all ten of the embryos we adopted. This resulted in three embryos that we transferred. August 19: Today we found out we are PREGNANT! This is still a critical time and we will know more at our first ultrasound. We hope to then find out how many of our three babies are developing and if there is a heartbeat(s). August 27: We had our first ultrasound today and found out we have ONE baby! Everything was so tiny, but we were very fortunate to see a little flutter that the doctor said was the heartbeat. September 13: We went in today for our eight-week ultrasound and everything looks normal. November 22: Tracy is approximately 18 weeks along at this point. We go in for our next sonogram where we hope to answer the boy/girl question. Tracy has had some minor pregnancy symptoms but nothing too difficult so far (easy for me to say). December 6: We had our 20-week ultrasound today and found out we are having a baby BOY! He appeared to be perfectly normal and healthy. We even got to see his fingers and toes. We are so in love with our little boy and are amazed at God’s miracle. February 25: Tomorrow I will be 32 weeks along in my pregnancy. Only 8 weeks to go! At the last doctor visit, I was measuring a little small so the doctor ordered another ultrasound. Our little one was fine and was actually measuring 3 days ahead of schedule. April 25: Forgive us our overwhelming joy in announcing the arrival of Jack Lewis Jones III, a.k.a. Trey. He arrived last night at 8:31 pm. He weighs 8 lbs 3 oz and measures 20 3/4 inches long. Tracy had a c-section and both Trey and Mom are doing really well. Words cannot express our overwhelming joy. Thank you to so many of you that have prayed for Trey and his arrival. We wanted to have a family, but we also knew that it would be difficult to conceive our own child due to my paralysis from a bicycle accident. It wasn’t until her OB-GYN suggested Snowflakes Embryo Adoption as an option in the wake of their infertility discovery that she remembered about the option. Before they knew anything of their infertility struggle, a coworker had told Stephanie about her friend having “Snowflake babies” and explained what that meant. Stephanie had thought at the time it was neat, but it wasn’t until her OB-GYN suggested Snowflakes Embryo Adoption as an option in the wake of their infertility discovery that she remembered about the option. In the following weeks and months, as the couple explored embryo adoption, they knew in their hearts that this was the answer to their prayers. The Hawkins transfer day came and all three of their embryos survived the thaw. At their doctor’s advice, all three embryos were transferred. Only one embryo implanted. The couple was saddened at the loss of the two embryos but thrilled to be pregnant. Stephanie’s pregnancy went well, and beautiful, delightful Annika was born. 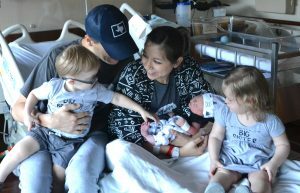 After giving birth, the Hawkins told their agency they wanted to have direct contact with the placing family, a move that placing parent Gina Yasuada calls an “unexpected blessing.” The two couples communicate regularly, exchanging e-mails and photos. And when Annika was 2 years old, the Yasudas came to meet her in person. Gina says it felt right knowing that Annika is where she’s supposed to be — with her parents. Annika is now a bubbly, outgoing and fearless 7 year old who fills her parents’ lives with joy. The idea of special case embryos (at risk for a possible genetic issue) thrilled my heart in a way that can only be explained as God moving. ...I learned I could be pregnant, wear maternity clothes, give birth, and breast feed my adoptive child. David and I were devastated after five hard years of infertility treatment to learn we could not have children. We had dreamed for years of the family that we would have together and had spent thousands of dollars and all our energy trying to realize this wish. One day we came upon the Snowflakes Embryo Adoption Program and were overjoyed. After accepting I’d never be pregnant, I learned I could be pregnant, wear maternity clothes, give birth, and breastfeed my adoptive child. 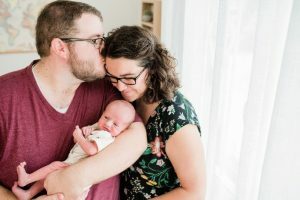 We were able to correspond with the biological family, share photos, stories, and medical histories, and have a connection for our baby to know his biological family someday. We felt so much love for the family staring at us in the photos, and their twins were the most beautiful children I had ever seen. I knew we were led to this family. After an amazing nine-month pregnancy, our little snowflake baby, Frank, was born in the middle of the night, in the middle of a snowstorm in a very crowded waiting room. He is such a joy! Frank was such a beautiful, calm, and social baby. He loved getting passed around and meeting new faces. As a toddler, his social disposition brought so much joy into this world. I see him leaning out of the grocery cart trying to play peek-a-boo with the stranger next to him. I see the stresses of the day melt from them as they smile and playback. He is such a force in this world. I’m so excited to see how God will use him as a future husband and father. We participated in the White House press conference supporting the veto of the bill that would have removed restrictions on the use of federal funds in research that requires the killing of frozen embryos. We are blessed to have our son Frank, born as the result of the wonderful gift of frozen embryos to us! 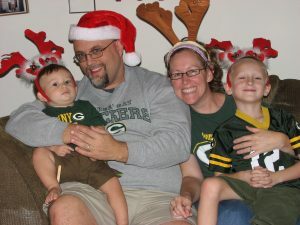 Dan and Kelli met on a Christian dating website in their early 40s. Dan and Kelli met on a Christian dating website in their early 40s. A year after marrying, the couple decided they should build their family. After eighteen months with no pregnancies, Kelli decided to visit a fertility doctor. Their dream seemed to be ebbing away after undergoing six months of blood tests and scans and getting no concrete answers. Finally, their worst fear was confirmed: Kelli’s eggs were determined to be no longer viable. She would not be able to conceive a genetic child. Kelli and Dan were heartbroken and grieved tremendously over the news. When visiting her family doctor for a routine checkup, Kelli recounted her test results through tears. The doctor suggested she and Dan look into embryo adoption, explaining the process of being able to experience pregnancy with the adoptive child. Intrigued, Kelli told Dan about the concept and together they spent hours researching online. The more they researched, the more they saw this was the solution they had been looking for. Kelli immediately began contacting embryo adoption programs. Unfortunately, because she was 45, many of the programs said they were not able to help her as she was past the age requirement. Determined, Kelli continued to seek more information. Finally, they contacted Snowflakes Embryo Adoption and was told she was not too old for the program. She immediately broke down in tears of joy. Dan and Kelli applied with the Snowflakes program and were matched with a placing family: Chris and Rebecca. After reviewing their family profile, Dan and Kelli knew immediately this family was perfect for them. They had many similarities and had gone through infertility struggles as well. Wanting an open adoption for their children, the two couples decided to meet face to face. Over dinner, they discovered they had more in common than they initially realized. It was clear the two families were meant to be matched with one another. “It was like a joining of hearts,” remembers Kelli. Once the adoption was complete, Dan and Kelli scheduled their first transfer date as soon as possible. 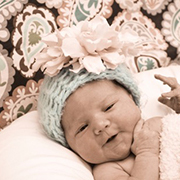 They transferred 2 embryos and two weeks later they learned Kelli was pregnant! She gave birth to their adoptive son in December. 15 months later, the couple welcomed a daughter from the same adoptive embryos. Kelli and Dan made a “life book” to help their children understand their unique story from an early age, which includes their other biological sisters and parents. Both families have visited each other’s homes, and in between visits they keep in contact over phone calls, email, Facebook, and Skype. Dan and Kelli (and Chris and Rebecca) believe this relationship is beneficial for all children involved. They want all the siblings to know each other and not be afraid to ask questions. We looked into the in-vitro process but were discouraged by the uncertainty coupled with the enormous expense. For so very long, Keith and I tried to get pregnant. It became painfully evident it wasn’t going to work. We looked into the in-vitro process but were discouraged by the uncertainty coupled with the enormous expense. Researching on the internet, we discovered the potential of the Snowflakes Embryo Adoption Program. We learned of the great success this option was providing couples like us. Our hopes were renewed. We applied with Snowflakes and they helped match us with a family with remaining embryos – a perfect, most wonderful family. The process was thorough, and in fairly short order, our hopes came true. We were pregnant and gave birth to our precious Samantha. We are so thankful for the embryo adoption option–it was truly the perfect solution for our family. Despite doctors telling them they were healthy, Dan and Jamie felt extremely discouraged that they were still not pregnant. After getting married, Jamie and Dan wanted to start a family straight away. After a year with no results, the couple went to see a fertility specialist. Finding no reason why the couple should not be able to conceive, their doctor suggested the couple try artificial insemination. After ten attempts at AI and a life-threatening pregnancy scare, the couple opted to try IVF instead. This failed as well. Despite doctors telling them they were healthy, the couple felt extremely discouraged that they were still not pregnant. “You’re kind of numb because it’s like, ‘Wow, this really isn’t going to happen? '” Jamie remembers. Jamie and Dan knew they were done with IVF. They could not bear to endure one more fertility treatment. They started to seriously consider the route of adoption. During a night of researching different adoption agencies, Jamie stumbled across the Snowflakes Embryo Adoption website. The idea of embryo adoption immediately intrigued her. She liked the fact she could experience pregnancy and give birth to her adopted child. She explained the concept to Dan and he loved the process as well. 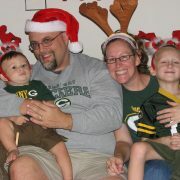 Jamie and Dan applied through the Snowflakes program and were matched with a placing family who had six frozen embryos. Those embryos were shipped to a nearby fertility clinic and two were transferred in Jamie. Nine months later, Jamie and Dan were finally parents to a beautiful baby girl. 16 months later, the couple welcomed their twin boys, born from the same set of embryos as their sister. They knew their family was now complete. Jamie and Dan are also in contact with their children’s biological parents. They keep in contact regularly through email and they travel to meet them every summer. The relationship has been valuable during Jamie’s pregnancies and when it comes to medical questions about their children. The couple also loves that they are able to answer any question their children might have about their biological family. Dan and Jamie are using an age appropriate method to explain to their children the unique way they came into their family. They have a book with seeds and different pictures of their family. They use the book to explain how the placing family donated their “seeds” and helped them have children of their own. Dan and Jamie’s daughter not only understood the concept but refers to the placing parents’ daughter, her biological sibling, as her sister. She even has a picture of her sister taped above her bed. “That told us that she got it and that it was special that it was her sister,” Dan recalls. They plan to tell the boys using the same method when they are old enough to understand. Just like many married couples, Matt and Charlie always knew they wanted to be parents. They dreamed of a large family, filled with laughter and joy. After eight years of trying to have a baby, that dream was becoming harder and harder to realize and then impossible after Charlie’s hysterectomy. Even so, they knew in their hearts they were supposed to be parents. They pursued a traditional domestic infant adoption which sadly fell through at the last minute. Discouraged, they seriously began considering whether or not they should continue to pursue adoption or any other family building method. They had expended tens of thousands of dollars with nothing to show for it. Just when they thought they had run out of options, they received a surprise inheritance from Matt’s uncle, who suddenly and sadly died in a car accident. Their whole family agreed the couple needed to use the money to try again to have a baby. Matt’s sister, Julie, volunteered to be a gestational carrier for them. Charlie politely declined, remembering with sorrow her previous failed fertility treatments. Julie, who was still willing to carry a pregnancy for them, suggested they investigate the Snowflake Embryo Adoption Program through Nightlight Christian Adoptions. They applied to the program, completed a home study and were matched with a placing family. This family created embryos through IVF with donor eggs, which later resulted in the birth of their daughter. Next, the donor conceived a son naturally and decided to place their embryos for adoption through Snowflakes. They carefully reviewed several family profiles and chose to place their embryos with Matt and Charlie, knowing that Julie would be serving as their gestational carrier. Daughter CJ was born much to the delight of everyone involved with making this dream a reality. Matt and Charlie have an open communication agreement with CJ’s biological parents and siblings. They think it is especially important for CJ to have a relationship with her biological sister. Though she is older than CJ, she was conceived from the same set of embryos that CJ’s parents adopted. They know allowing their daughter to have that connection will be extremely beneficial. A life without children seemed a curse without a cure. My whole life I had dreamed of motherhood only to have those dreams crushed with the words “You and your husband are not likely to conceive children together.” For seven long years, we waited for our empty arms to be filled. I read an article from Focus on the Family about embryo adoption. 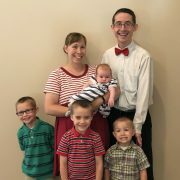 We quickly decided to pursue this exciting adoption option and finished our home study and submitted all our paperwork. In what seemed like no time at all, we received the much-anticipated phone call! A genetic family in the northwestern United States had chosen us to adopt their embryos. They mailed us a letter about themselves and pictures of their family. Transfer day arrived. Two weeks later we received the news we had waited so long to hear. I was pregnant! Nine months later, we sat staring at the most beautiful little boy we had ever laid eyes on. Our hearts are filled with gratitude for the family that chose life for our son and allowed us the privilege of becoming parents. When we look at our son, we see the fingerprints of God. Infertility was a devastating storm in our life, but the seasons of plenty that came from the rain resulted in a gift of hope—our son, snowflake baby #8, Tanner James. The couple was shocked at first. This news was a death of a dream; a death of an expectation. After James and Kristy were married they felt no sense of urgency to start a family. At the time, James was busy working as teacher and Kristy was just finishing up cosmetology school. But after six years, they started to wonder why they were not getting pregnant. After some discussion, the couple decided to visit their doctors. Kristy’s test results came back stating she was healthy and she should have no trouble conceiving a child. However, James’ test results showed he had a zero sperm count; he would never be able to father a genetic child. The couple was shocked at first. This news was a death of a dream; a death of an expectation. When you get married, you’re expected to have children. Most people don’t ever consider they will have fertility issues. After the shock had worn off, they started looking into other ways to build their family, for they believed God had a plan. James and Kristy first heard about Snowflakes Embryo Adoption through an article in a magazine. The article explained how Snowflakes allowed families to adopt frozen embryos from other families that had undergone IVF. The mother is then able to carry and give birth to their adopted child. At the time, the couple did not think much of it (as they were not looking into adoption at that point). Six months after receiving the infertility diagnosis, one of Kristy’s clients opened up about her own struggle with infertility. After Kristy explained she was facing the same issue, the client proceeds to tell Kristy about her friend who adopted a baby through the Snowflakes Embryo Adoption—the same program they read about in the magazine. They came to the conclusion this was the way they were supposed to build their family. Their decision was solidified after the death of James’ grandfather, who left the couple an inheritance which was enough to cover the costs of the adoption. After going through a home study and through a matching process, James and Kristy adopted eight frozen embryos. The fertility clinic advised they thaw all eight, due to the fact that not all embryos survive the thawing process. Out of eight, only three survived the thaw. All three were transferred and an ultrasound weeks later revealed Kristy was pregnant with twins! Kylie and Luke (who are Snowflake babies #84 and #85) were born. James and Kristy are open with their children about the adoption. Kristy wrote a journal them, explaining how they joined their family. And the twins love it! (Luke especially loves the fact that he was delivered to the clinic via FedEx truck!) The couple strongly believes it was God’s plan for the twins to be a part of their family. And for that, they say they are truly blessed. If they were going to adopt, they knew they wanted to pursue a program that had a big need for adopting parents. 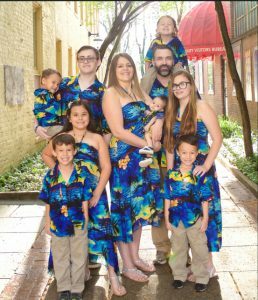 When Josh and Kjersten got married they knew that they wanted a big family, so they started trying to get pregnant straight away. Kjersten started to feel sick with unexplained, severe hot flashes. Her doctor discovered she had primary ovarian insufficiency and she would have a < 5% chance of getting pregnant naturally. Surprise! Six months after learning about the condition, Kjersten did become pregnant! Sadly, she miscarried at nine weeks, which was devastating for both her and Josh. They knew that was probably their 5% chance of conceiving and that it would not happen again. Josh and Kjersten spent the next couple of years saving money for their adoption. They were amazed that after completing all of their application paperwork and home study they were matched with a placing family within a week! The placing family that had chosen them had sixteen 2 and 3 day (day frozen) embryos. They scheduled their first frozen embryo transfer. Three of the embryos were thawed and 2 survived. Their doctor assured them by explaining how healthy the surviving embryos looked. Two weeks after the FET they found out Kjersten was pregnant, but at eleven weeks she had another miscarriage. The couple was absolutely crushed over a loss of a second child. But Josh and Kjersten had 13 more embryos they had accepted responsibility for and they scheduled a second FET. This time 4 embryos were thawed and again 2 survived. After the transfer, two weeks later the pregnancy test came back positive! Kjersten was able to carry until 32 weeks but had to be induced early due to preeclampsia complications. Even though Eleanor was born early, she was extremely healthy and active. She is happy, curious, and loved. Josh and Kjersten cannot wait to bring her nine brothers and sisters out of frozen storage and welcome them into their family one day. The initial testing had left us without answers. We were preparing to meet with a reproductive endocrinologist (RE) and were nervous about the ‘next steps’. It was a dark snowy Friday night when I was driving to meet my husband at a local fundraiser. I typically drive in silence but I had stumbled across a radio program that caught my attention. My husband and I been unsuccessfully trying to build our family for over three years. The initial testing had left us without answers. We were preparing to meet with a reproductive endocrinologist (RE) and were nervous about the ‘next steps’. At the time we did not know embryo adoption existed. Should our next step be IVF? Could we do IVF and still honor our faith and honor life? These discussions were weighing heavily on my heart. As I listened, the message focused on the sanctity of human life, even in its earliest stages, and my tears welled up. A part of me was scared this was my answer: IVF was not part the right choice for us. As I arrived at our destination, I saw my hubby, rolled down my window and said I would meet him inside. As he walked away, the message concluded and right there in front of me, fireworks started going off. I couldn’t have planned the timing better, but there they were…. Fireworks. A few weeks later our RE advised us that they would do a workup on me and then likely would recommend IVF if all came back ok. We shared our beliefs with them about not creating more embryos than we would use. They hesitantly agreed to honor our wishes, warning us our chances of conceiving would be significantly reduced with these restrictions. We left feeling a little defeated and more confused than ever. We returned to our RE’s office ready to discuss the recent test results and next steps. We were floored when our doctor said ‘premature ovarian failure’ and said our chances of conceiving even with IVF and without any of our ‘restrictions’ were less than 5%. I was shocked! I was angry. I was confused. I was every emotion under the sun. I was devastated. But now we knew for sure: the door to IVF was shut. Somewhere in the fog of the next few months, I learned of embryo adoption and that night of fireworks started to have new meaning and new hope. I had been heartbroken over the possibility of not being able to feel life grow inside me. I wanted to experience the joy of childbirth. Embryo adoption truly was and is the answer to our prayers. We began our embryo adoption. A year later, we had been through one failed FET and had been matched with a second family. We were head over heels in love with this family. They had chosen life for their three embryos and had agreed to place them with us. We felt such a strong connection to the family and were overjoyed with the match. When our embryologist received the embryology report, she called to tell us we should consider sending the embryos back. We quickly said no, we were committed to our babies. She went on to tell us the embryos were graded a B, BC, and C and there had been a power outage when they were being frozen. The power blipped for just a second and then the generator kicked in, but with the fragility of embryos, she feared we wouldn’t even have viable embryos once they were thawed. We were crushed but held onto hope that this was the plan for our family and we needed to stay the course. Two months later we were pleasantly surprised to show up for our transfer with two viable embryos ready to transfer and one left safely in cryopreservation for a future attempt. On September 15th we heard the words we had waited so long to hear: “You’re pregnant!” On June 2 we gave birth to our beautiful baby girl, Makenna Lee. And let’s not forget about that little ‘C’ embryo that was waiting in the freezer for us. Against all odds, he survived the thaw beautifully and we completed our family with the birth of the sweetest boy ever, Alexander Brooks. While embryo adoption may not be the right choice for everyone, it blessed us beyond expectation and measure. … Since they suspected they might have trouble conceiving, they did not waste any time when they didn’t get pregnant quickly. Ardent musicians Terri and Jason started to date in their mid-twenties. From the very beginning, they understood that infertility might be an issue for them. Terri had known since she was 16 years old she had Polycystic Ovarian Syndrome (PCOS). The couple agreed that when the time came they would be open to the possibility of adoption. They married and decided to hold off on starting a family and focus on their music. That all changed in when Jason had a heart attack. Thankfully he recovered from the trauma without any complications, but it completely changed his and Terri’s attitudes on life. They now focused more time and energy on starting a family. Since they suspected they might have trouble conceiving, they did not waste any time when they didn’t get pregnant quickly. Both went to be tested by their doctors. Terri was surprised to learn that she was in great reproductive health should have no issues with pregnancy. Unfortunately, Jason was informed that he had azoospermia and would not be able to conceive children. The couple felt a horrific sense of loss from realizing that they would never be able to conceive on their own. They learned about Snowflakes Embryo Adoption from their fertility doctor and decided to do more research. 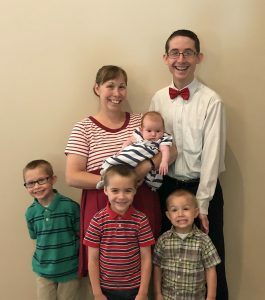 Both Terri and Jason liked the fact that they were able to know the biological family of their adopted embryos and decided to go ahead with the program. They applied and were matched with a family that had seven 2Pn embryos. The doctor at their fertility clinic explained that he had success with these embryos and there was no reason that the transfer should not result in a pregnancy. 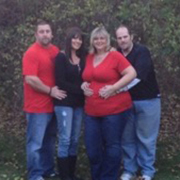 Under the guidance of their doctor, all seven of Jason and Terri’s embryos were thawed. The plan was to transfer two and refreeze the remainder. However, two of the embryos died during the thaw and two more died during incubation. Of the three embryos that were left, only one was considered strong enough to result in pregnancy. The couple decided to go ahead and transfer two embryos (one being the strong one) and let one embryo grow out for another day to see if it could be refrozen. The next day, they heard from the doctor that the last embryo had died. After the transfer, Terri and Jason waited on pins and needles until they were able to take a pregnancy test. They did not have any more embryos and knew that they would have to wait even longer to try again. Two weeks post-transfer they took a pregnancy test, it came back positive! They imagined they would begin their family right away, but unfortunately, about a year into their marriage, they were diagnosed infertile. We want to help our families with remaining embryos choose a family to give birth to those embryos. We just couldn’t believe, after all these years, we were going to be parents. This was the answer to not only years of individual, but collective prayers. Like many couples, during our courtship and early marriage we talked often of the day we would be parents. Children are a gift from God and we definitely wanted our quiver full! You can imagine our dismay after a year passed without any success. This turned into a seven-year journey of medical interventions. Early on we considered adoption, but continued to pray to the Lord and ask Him to confirm His will for us. While on the Internet one day, I came across embryo adoption. I was excited to find that there might be an opportunity for us to not only adopt, but also carry the child. After discussing this option with our doctor, we were ready and eager to begin. Although we considered other agencies, we were impressed with the dignity that Nightlight Christian Adoptions brought to the process and the emphasis that they placed on the value of these little lives. At the end of 2006, I contacted them and began our paperwork. In early 2007, we were so surprised and humbled that we had been selected by a couple to adopt their five embryos. We read through their profile and immediately felt a connection to them. After praying about the decision, we contacted Nightlight and let them know that we wanted to proceed. 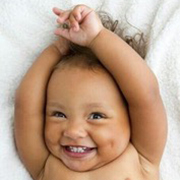 Having gone through the embryo transfer in October 2007, we eagerly awaited to find out the results. I didn’t sleep well the night before my doctor’s appointment on November 12th. And at 5:00 that morning, I couldn’t wait any longer. I took a pregnancy test and to my amazement it came up positive for pregnancy. I dissolved into tears and woke Eric up to tell him we were expecting. This is one of the sweetest moments we have ever had in our marriage. We just couldn’t believe, after all these years, we were going to be parents. This was the answer to not only years of individual, but collective prayers. My pregnancy was a wonderful experience, a truly happy time for us. It is amazing to witness the handiwork of God. On July 8th our beautiful baby daughter came into this world. The best day of our lives! As Eric says, “We’re smitten!” Although we thought we understood, we now realize that the emotions of love and protection that you feel when you hold your baby are truly overwhelming. There are still times we find ourselves in tears, simply in awe of Kaitlyn’s presence in our lives. She is our miracle! We truly feel blessed with our experience and at peace with our decision. Countless fertility treatments failed IVF, failed frozen embryo transfer, a devastating stillbirth, an interrupted adoption, year after year, longing for children without success. In our wildest dreams, we never thought we would be faced with deciding what to do with remaining frozen embryos! Then, seven years and four children later, we knew our family was complete. We had 14 embryos in frozen storage. We struggled with the decision of what to do with these little lives. Destroying them was not an option for us. It was very important for us to know that if they were given the chance to grow into babies that they were loved and safe. Our clinic suggested we look into Snowflakes®. We contacted Snowflakes and discovered we could decide who would receive our embryos! That’s when we knew this was the path that was best for us. Throughout the matching process, we were not sure what we wanted in terms of communication with our adopting family. We at least wanted to know if children were born and to be able to receive pictures and updates at least once per year. We were open to eventually meeting our genetic children and the adopting family. Those were our original communication expectations. In reality, we have gotten so much more than we ever could have hoped or imagined. Soon after the match, we were communicating with the family we had chosen through the agency. Eventually, that led to direct email contact and, when they learned they were pregnant, a mutual exchange of phone numbers. When their son was born in October 2016, we had pictures within minutes. Communication continued almost daily with wonderful images showing how much he was changing. My feelings about this baby boy were mixed: but I knew our adopting family wanted a child as much as we did when we were struggling to build our family. Then the idea of meeting face-to-face was raised. We were grateful, but also apprehensive. In December 2016, when their son was just a couple months old, we decided to take an 8-hour road trip with our 4 children to meet them. What an amazing, incredible experience! Holding the baby and meeting his parents confirmed for us we had made the right decision. The parents were so kind and understanding—they were easy to talk to and made sure we got to enjoy our time with the baby. We were able to see their home and the area where their son will grow up. Spending time with them was amazing and did so much to ease our apprehension. Now we feel like we have an extended family! Their son (and hopefully future children as well!) will grow up knowing about us and knowing that we love him and made our decision based on our love. We continue to communicate with our adopting couple of times a week, and they already have plans to come visit us this summer! We truly feel blessed with our experience and at peace with our decision. There was no way that he and his lovely bride-to-be could have anticipated that the emblem of the Games – a simple Snowflake – would reappear in their lives in an unexpected way. Is Donating Your Embryos The Right Choice?
" It wasn't an instant choice, Cecile said. "I took us three years to make the choice. We wondered, 'Is it okay to give away your embryos because it isn't convenient?'" After the birth of the first daughter, Cecile and Michael wanted to grow their family, so they turned to in vitro fertilization. They joyfully welcomed their son as a result. However, when they naturally conceived their third child, they knew they would need to do something with their remaining embryos. The couple agreed to donate their embryos through the Snowflake Embryo Adoption Program, where they were matched with an adopting family, Joanna, and David. Joanna and David had one child and were eager to have more. 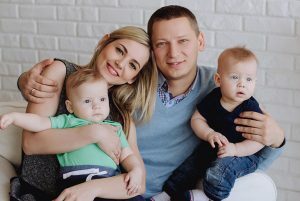 After several miscarriages, they tried a number of fertility treatment options but eventually decided embryo adoption was the right fit for their family. They liked the idea of Joanna carrying the child, which gave them the opportunity to share the pregnancy with their son, and bond as a family before the baby even arrived. “We knew there were families who had remaining embryos and that those families might be struggling to decide what to do with them. We felt like we could alleviate some of that burden and grow our family,” says David. Like many families who participate in the Snowflakes program, they were initially a little hesitant about an open adoption; as time went on, though, they became much more comfortable getting to know the placing family. The Joanna and David are grateful to Cecile and Michael for their gift. The circumstances and decision for each family are different. Given the challenges we have faced and our current ages, our decision was ultimately the right one for us but yet it was incredibly difficult to make. We spent over 10 years trying to start our family before our son was born. As a result of IVF treatments, we now have three children at home, a boy (9), and twin girls (7). Because of the Snowflake Embryo Adoption program, we also have two healthy genetic children, a boy and a girl (twins), who are being raised by their wonderful adoptive parents. The circumstances and decision for each family are different. Given the challenges we have faced and our current ages, our decision was ultimately the right one for us but yet it was incredibly difficult to make. We saw the embryos as children so we felt our options were 1) donating them anonymously through a clinic or agency with no say in the choice of parents or 2) choose a family to place them with through an embryo adoption program like Snowflakes. Doing nothing or donating the embryos for science was not an acceptable alternative for us. It was a few years before we considered what to do with the remaining embryos. With eight embryos left, we faced the possibility of not just one more child but 2, 4 or more. We also considered that we would be in our late sixties when these children would be in their teens and early twenties. We wanted the children to have younger parents whose values were similar to ours, which is why we chose an open adoption process through the Snowflakes program. The decision to place the embryos for adoption was still exceedingly difficult. Since we had been through the adoption process at an earlier time and knew what was involved a home study, friend’s letters of recommendation, background checks, and legal documents we knew the adoptive parents would be well screened by the program. We prepared our papers, assembled some pictures, and then sent them to the program. We waited for a few weeks for information about the prospective adoptive parents. We didn’t find someone ‘just like us’ only younger – but we did find a couple who had been married for seven years and were suffering from infertility. They were in their late twenties/early thirties, very loving and very caring. The staff answered our questions and concerns about the couple. Were they both really committed to this adoption? Were they going to be able to handle it financially? Will they accept multiples? Did they have other support from friends and family? With the answers provided, we were willing to proceed. From the first reading of the letter from the prospective adopting couple to the signing of the adoption papers, we prayed. We prayed that the children would survive the thawing process, that the procedure would work the first time for the adoptive parents, and the children be strong and thrive. We prayed that the financial burden would not be too great for the adopting parents. All our prayers were answered. They gave birth to healthy twins, a girl, and a boy! The parents sent us an email to let us know that everyone was healthy and happy and sent pictures as well. Since then, we have received periodic updates, which we hadn’t expected at all. When we signed the adoption papers, we never thought that we would see the faces of these children. Now we have and that in itself is a tremendous blessing. We are comforted, knowing that they are in a loving home. We trust their parents to raise them as best they can. We are trying to do the best we can with the three entrusted to our care in our home. Kurt and I agreed we were done now having children, yet I didn't feel we were finished--what were we to do with our remaining embryos was nagging me. Kurt and I, after trying so long to get pregnant on our own, were so thankful that in-vitro worked the first time around, blessing us with Kevin, Kyle, and Samantha. What a joy they are in our lives! We agreed we were done now having children, yet I didn’t feel we were finished–what were we to do with our remaining embryos was nagging me. I couldn’t leave them in limbo, and I wasn’t at peace with them being destroyed by donating to research. Learning about embryo adoption was interesting, and a bit overwhelming at first. The idea of strangers giving birth to my embryos…wow! But at the same time, it made sense. It was a great solution–It could save the lives of our embryos and give the life of a child to a couple much like us, one we would choose. The embryo adoption process at Snowflakes enabled us to match with the adopting couple to ensure a loving, secure home. Today we can’t imagine anything greater. The adopting couple is incredible parents and their little Samantha couldn’t be more blessed. Embryo Adoption fulfilled our hopes and finished the process with everyone living happily ever after. When Justin and Amanda decided to pursue in vitro fertilization after the birth of their first child, they always knew they would end up donating their remaining embryos. When Justin and Amanda decided to pursue in vitro fertilization after the birth of their first child, they always knew they would end up donating their remaining embryos. After their IVF treatment resulted in twins, the couple tried unsuccessfully to have more children. Eventually, the emotional and physical toll was too much to take, and they decided to stop treatment. For Amanda, who was adopted herself, the open adoption option was appealing. She grew up not knowing her biological family and didn’t want the same thing to happen to her biological child. “Not having that connection was always an empty spot for me. I wouldn’t have been okay with an anonymous placement,” she said. The couples chose to work with the Snowflakes Embryo Adoption Program and started the process of selecting a family for their remaining embryos. They ended up choosing the family in the first profile they reviewed. But they did – Amanda and Justin agreed to a match with Ryan and April, who adopted their embryos. 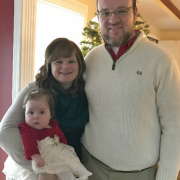 When Ryan and April’s second daughter was just six days old, she was diagnosed with a genetic disorder that ended up taking her life just a few short months later. April and Ryan looked into different options and when they heard about embryo adoption they knew it was the right choice for them. April liked the fact she could carry the child herself – something she knew her body was capable of doing. They also liked the idea of having some control over the timing of adding more children to their family. Amanda is candid when she speaks about her experience and admits that giving up her remaining embryos is not always an easy decision to live with. Ryan and April acknowledge their own loss of not having any more of their own biological children but would recommend embryo adoption to anyone looking for alternative methods to grow their family. “Thirty years ago, we wouldn’t have had genetic testing. Now, because we know what our genetic makeup is, we couldn’t bring ourselves to take the risk [of having more biological children]. That would have been a risk we were taking with someone else’s life,” Ryan says. “Being where we are medically, and being denied our freedom to have more children in ignorance, that same medical technology brought us the opportunity to have Corinth.”. Their lives were valuable to us. Therefore, we knew that taking their lives by thawing and disposing of them or using them for scientific research was not an option for us. The pregnancy was extremely challenging for Rebecca, and after the twins were born it was made clear they would not be able to use their remaining embryos. It took nearly six months to finalize our divorce and now I faced the reality of what to do with our four remaining frozen embryos. After an IVF cycle producing 19 embryos, two embryo transfers and the birth of 3 children, we knew we were done building our family and needed to decide what to do. After considering their options, and with extensive prayer, the couple realized the embryos were not theirs to keep. Tom and Anabelle met on Memorial Day weekend while Annabelle was vacationing in San Diego from Brazil. They were engaged within eight months, married in a little more than a year. They assumed children would follow just as quickly, but years passed without any babies. After seven years of trying, they started in vitro fertilization treatments. After a single embryo transfer, their son was born. Five embryos remained. When their son was about 14 months old, Anabelle found out she was expecting again and was 12 weeks pregnant with their second son. What a wonder, given their previous struggles! 15 months after he was born, the Petersens found out Anabelle was almost 8 weeks pregnant with their daughter. The Petersens now had three children— and five frozen embryos who needed them to decide their future. Tom began to research what they could do with their remaining embryos and discovered the Snowflakes® Embryo Adoption program. Tom first presented the idea of using the Snowflakes program to Anabelle when their daughter was about a month old. She wasn’t ready to make that decision. One day, as Anabelle considered and prayed about the future of her remaining embryos, she felt that God gave her the answer she was seeking. “I believe I heard God telling me; the embryos are not yours, Anabelle. They are a gift from me!” This gave her the answer she was seeking and the peace she was craving. The couple agreed to place their remaining embryos for adoption and their journey towards finding a family for their embryos began. In December, Tom and Anabelle received an e-mail with a possible match. The moment Anabelle started reading Bert and Kryna’s family profile she just knew this was the right match. Tom agreed. When the adopting family traveled to San Diego for their first frozen embryo transfer, it was ’love at first sight. The Bert and Kryna welcomed their first adopted child, a son, the following year. When he was 16 months old they traveled again to visit Tom and Anabelle. The purpose of this trip was to introduce Anabelle and Tom to their son and to have a second FET. Their second adopted son was born in 9 months later. Tom and Anabelle were pleasantly surprised that their open adoption would be so sweet. The adopting parents recently had their final transfer using the adopted embryos. They are expecting their third child in early 2017. Tom and Anabelle’s children say, “Wouldn’t it be so cool if they have a family just like us? Boy, boy, girl?” They will find that out soon! When our twins were two, we felt we needed to face the hard decision of what to do with our remaining embryos. Then we heard about an embryo adoption program in California. I said to my mom, "I think the best solution is to place our remaining embryos with another couple so they can fulfill their desire to be parents!" s. They fell in love on the dance floor at the same friends’ wedding. In their wildest dreams, the couple never imagined they would struggle with infertility.